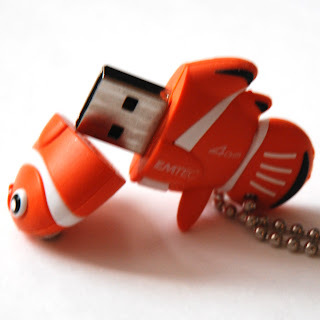 CardMonkey's Paper Jungle: Organizing, Part III: Swimming in Files? Okay, I couldn't resist the sneak ... Fish!? What is CardMonkey up to now?! Well, here it is: Meet Nemo, or at least a lookalike brother. 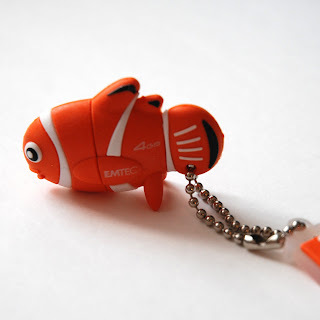 This little cutie, made by EMTEC and available at Staples, is an adorable thumb drive (some call them "flash drives") for your computer. Nemo may look small, but he holds a whale-sized amount of files -- 4GB. Take a look: take off his head to reveal the USB hub. On this drive, I have every digital image and SVG file I've ever bought, swapped, developed or been given -- backed up here (the main files are on my hard drive, which is also backed up onto my network server). This way, I can carry around my files very easily to crops, when I travel, etc., and know my protected files are safe at home. I use thumb/flash drives for many different things -- they're inexpensive and a great way to have extra/handy copies of your files. On some thumb drives, I've scanned and saved magazine pages I've dog-earred to "try soon", or tips I find handy to have while crafting. Now I am blessed in that my hubby is a computer geek, so I have a desktop computer with large monitor upstairs in the Paper Jungle, as well as another computer downstairs in my office. I have a laptop computer as well that I keep in the Paper Jungle, linked to my Cricut. You can see that one, here, below my paper racks. When my thumb drives aren't traveling with me and the laptop to a crop or travels, I was given the cutest MugHugger by Nicolette at Beyond Scrapping. Thank you, Nicolette! She makes these for sale, very reasonably priced, in custom colors. 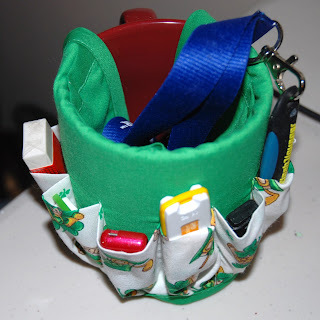 Look at how cute these little pockets around my mug hold my thumb drives! If you look closely in the photo above (of the paper racks), you can see that this mug is snug as a bug (still being silly Seussical!) next to my laptop. 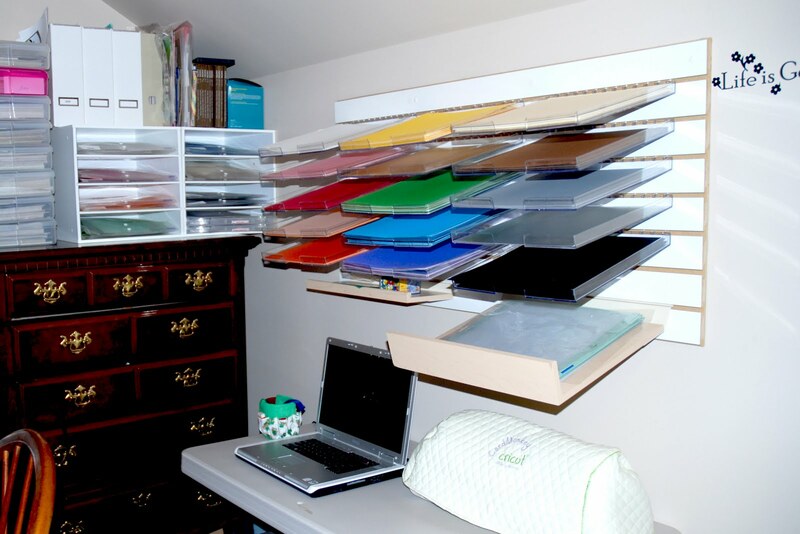 Stay tuned tomorrow for more organizational ideas from the CardMonkey's Paper Jungle! What a cute little fishy! Wow, that's a lot of computers, having hubby a computer geek helps too I'm sure. I love your paper trays on the wall there, awesome! Have a great day! Being a Disney finatic I love this. You are such an inspiration. Great organization ideas! I'm sharing an award with you, please stop by my blog to pick it up. I think you are super sweet! What an adorable thumb drive!! !